My favourite time to go out these days are Monday to Wednesday, avoiding the weekend rush and being able to take my time at a restaurant. 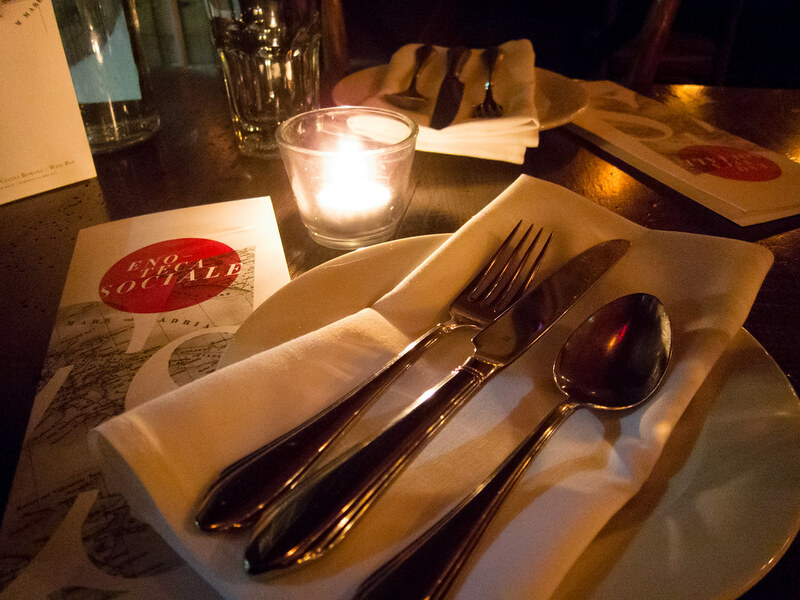 It’s also easier to get a table at more popular venues. 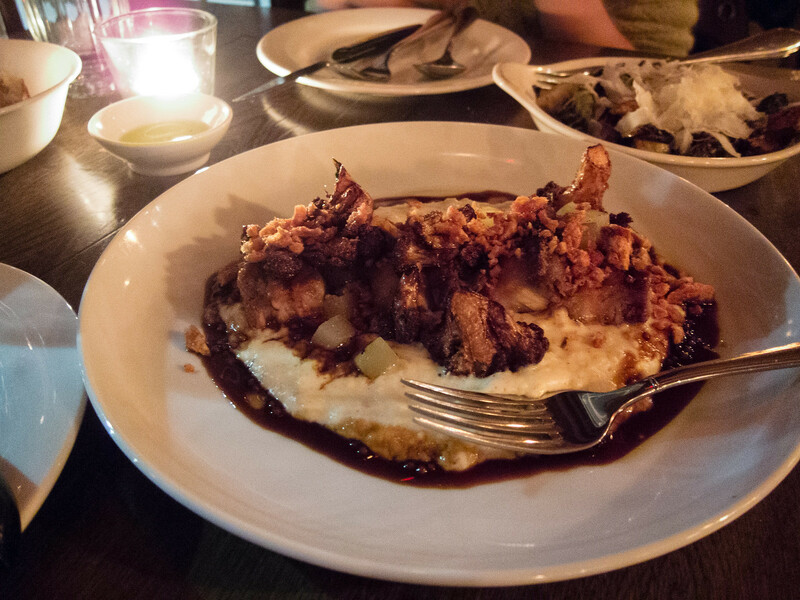 I met a friend at Enoteca Sociale on a Wednesday to catch up over wine and Italian food. 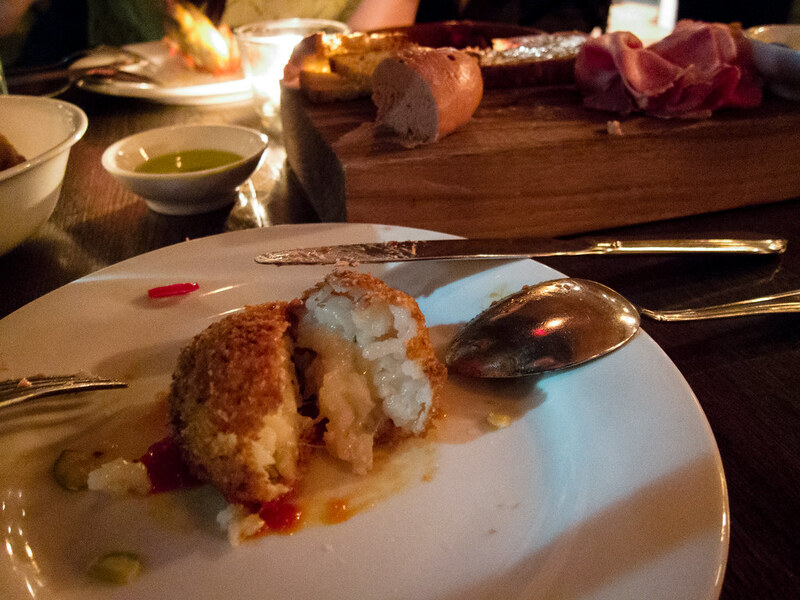 Often listed as one of the best Italian restaurants in Toronto, I had high expectations. 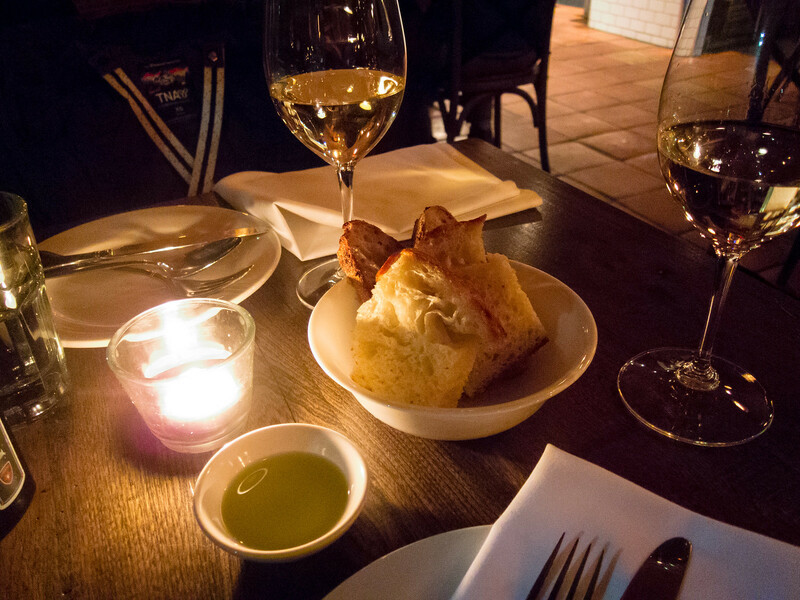 Atmosphere: A visit to Enoteca starts at their beautiful front doors, wood burned with an intricate map of Rome. The interior was dimly lit, cozy and intimate with simple wooden furnishings. Even on a Wednesday night, the dining room started off full. Conversation levels were quiet and there was no background music to yell over. The restaurant felt elegant without being stuffy. 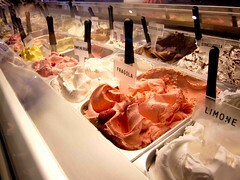 Service: We mainly interacted with the hostess and our server who were both friendly and attentive. Between the two, we were well taken care of. My friend and I drank at a different pace. When I was ready for my second glass, our server noticed and came by. Ten minutes later my friend finished her glass but our server was busy at another table. The hostess noticed us trying to get her attention and came by to help. Food: As per usual, I ordered too much food. 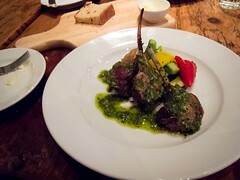 Luckily, we stuck around for a solid two hours, which gave us enough time to enjoy each dish at a steady pace. 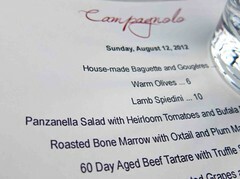 Even with a simple menu, I had a hard time narrowing down choices, everything sounded delicious. 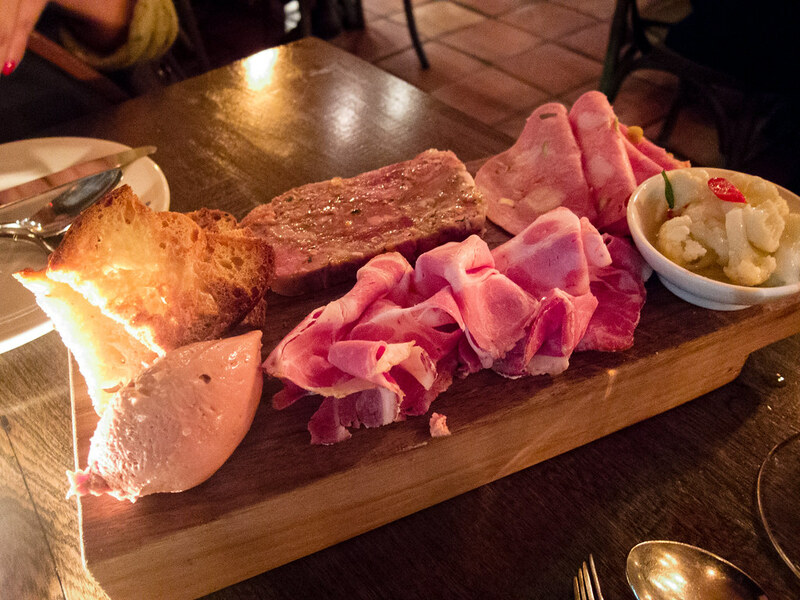 Our first appetizer was the salumi board that came with two cured meats, chicken liver mousse and a pork terrine. Portions of each selection was generous. 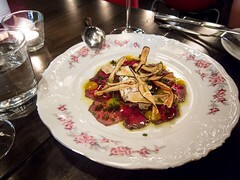 I enjoyed the savoury liver mousse while my friend preferred the terrine. Aracini’s were $4 a piece and a must-try. 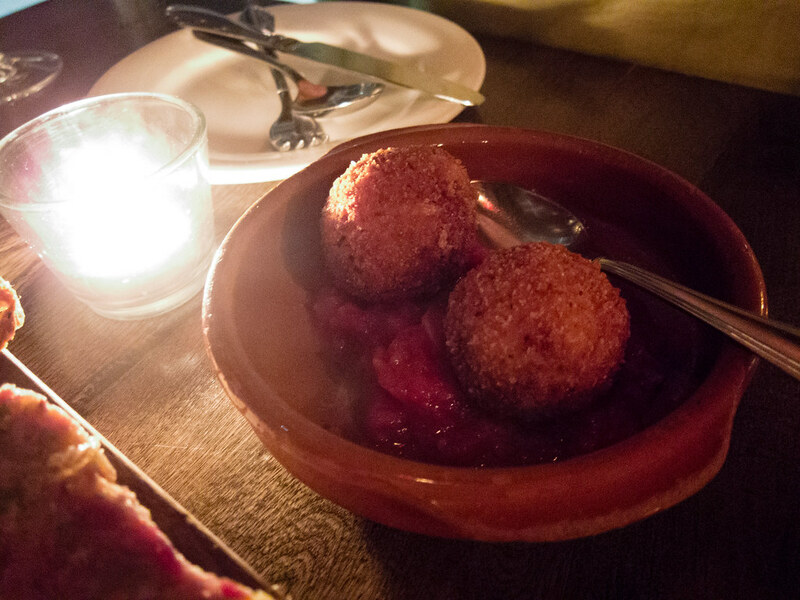 They’re basically deep fried balls of risotto and cheese. The interior was creamy and the exterior a perfect crispy crust. With a spoonful of the tomato nduja sauce, it was rich bite. For our mains, we split the Pork Belly, a plate of Bucatini and a side of Brussels Sprouts. I think I’ve found my new favourite pasta with bucatini. I loved the thick noodles and the texture at Enoteca was perfect. The simple tomato sauce was well seasoned with a hint of heat. 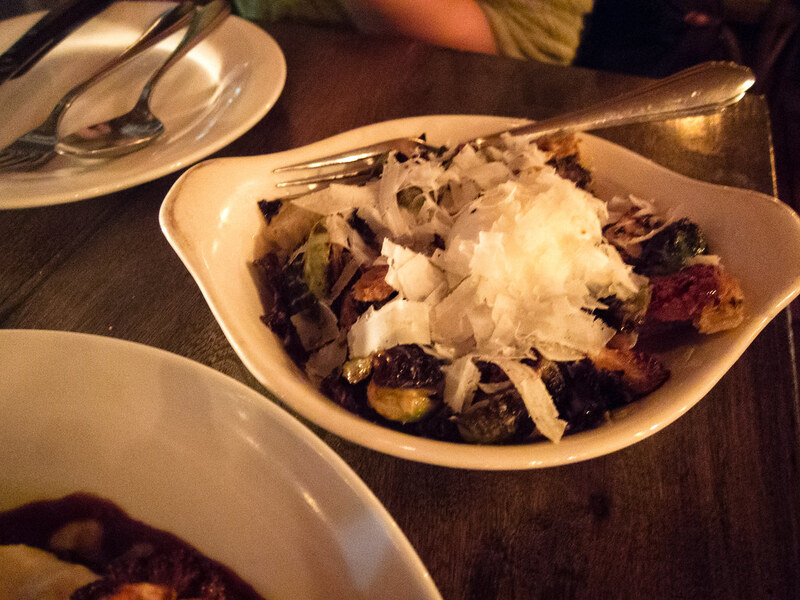 If you’re looking for a healthy side dish, the Brussels Sprouts might not be the best choice. While delicious, the vegetables were covered with fresh cheese and croutons. A soft boiled egg was also hidden under the cheese shavings, the best kind of surprise. At this point, i was pretty full and for me the Pork Belly was a heavy dish. Charred on the outside, the meat was still really fatty. There was lots of flavour, The polenta was creamy and the mustard seeds added a crunch to each bite. 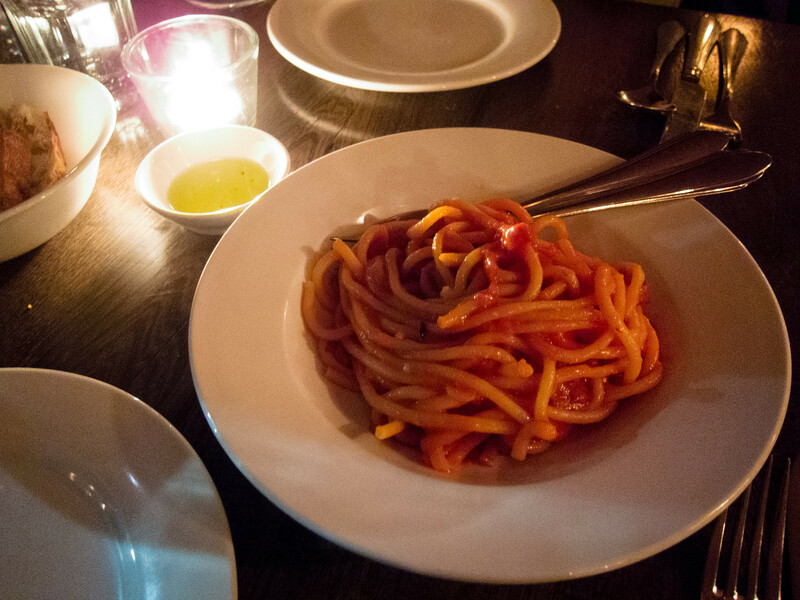 Overall, my favourite dish at Enoteca Sociale was their pasta. While my high expectations weren’t 100% met, it was a close 90%.